CORVALLIS, Ore. – The more people a city has and the more organized its residents’ movement patterns, the longer its flu season is apt to last, new research at Oregon State University shows. Corresponding author Benjamin Dalziel, a population biologist in the OSU College of Science, worked with an international collaboration to analyze weekly flu incidence data from 603 cities of varying size and “structure” – that is, patterns people follow in where they live and work. The researchers found that in metropolises, flu cases are more spread out through the winter months, including early and late in the season, when the weather is not optimal for transmission. By contrast, in smaller cities, more cases will be tightly grouped in a short period of time, during peak season, when climate conditions are best for transmission. 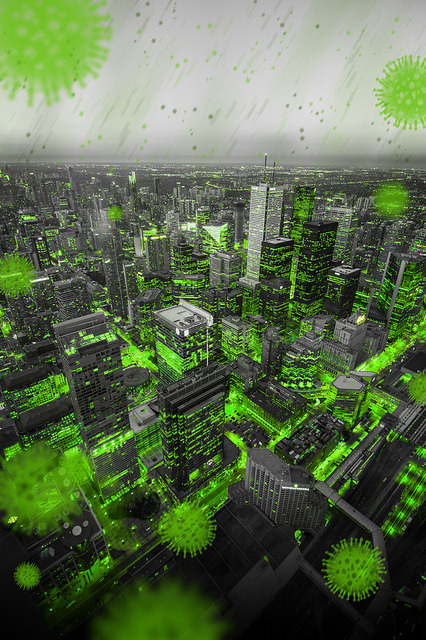 “We found that as cities become larger and mobility patterns become more highly organized, climatic conditions play a relatively smaller role in influenza transmission,” Dalziel said. Flu is an immunizing infection – once people have been infected by a certain strain, they’re unlikely to become infected again, at least not right away, because their immune system recognizes it and typically can deal with it efficiently. “From the flu’s perspective, it’s facing a limited resource each season – the fraction of the population susceptible to a given strain declines as it spreads,” Dalziel said. Counterpunching the immune system responses, flu viruses are constantly evolving – they switch up the proteins that the immune system responds to, shuffling in new ones that aren’t recognized right away. While Dalziel is excited about the findings he does stress a few caveats. Researchers from the University of Cambridge, Princeton University, Pennsylvania State University and the Fogarty International Center, National Institutes of Health collaborated on this study. The Bill & Melinda Gates Foundation, the Department of Homeland Security and the Fogarty International Center, National Institutes of Health supported the research.